For me, a big part of Christmas is the giving of homemade edible gifts. 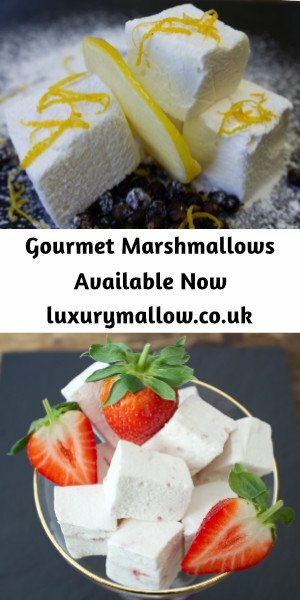 Luckily I’ve been able to get ahead with making various chutneys, chilli sauce and chilli jam earlier in the season but I always like to add some kind of cake or sweet treat to my gift hampers nearer to Christmas. 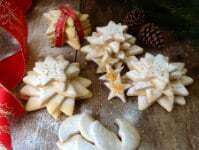 In previous years I’ve added mini Christmas cakes, mince pies and mini stollens but this year I wanted to go with a sweet treat that would be more suitable for children too. As I’ve been making rather a lot of brownies lately for part of recipe testing of a new project I’m working on (watch this space) brownies were in abundant supply. 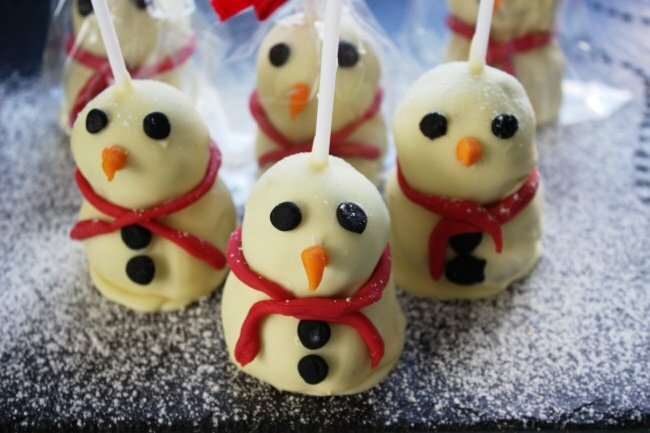 So it seemed natural to use my leftover brownies to have a go at making snowmen brownie pops – snowmen themed treats are all over Pinterest at the minute. It’s not really a recipe as such, more a matter of giving you the basic tips and then you can be as creative as you like with the decorating. You’ll see from the photos, I’m not a cake decorator. Some of my Twitter and Facebook friends are dab hands at it and even professional cake decorators but me, “I don’t do cake decorating”. You can decorate your snowmen with red sugar laces for a scarf or you could even give him ear muffs. Or maybe replace the fondant carrot noses, coal buttons and eyes with sugar balls if you don’t fancy making them with fondant, it really is up to you. 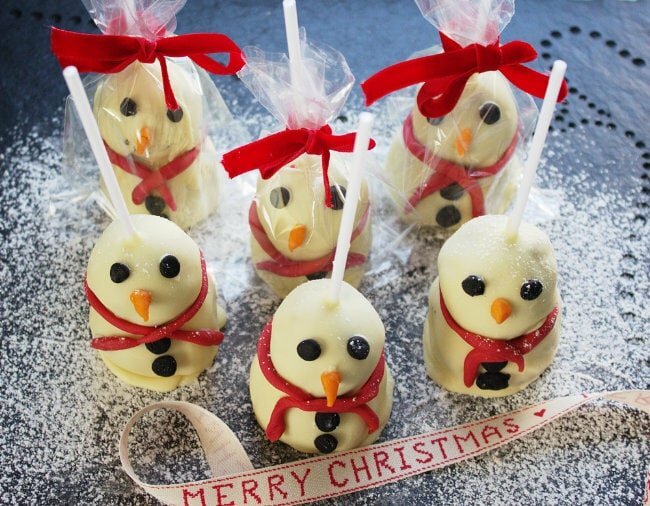 Once your snowmen are suitably chilled, dip them in melted white chocolate. I did add a small amount of vegetable oil to the white chocolate so it was easier to work and no worries about tempering. All you need to do next have some fun decorating your little creations and I’m sure the kids would love to help too. 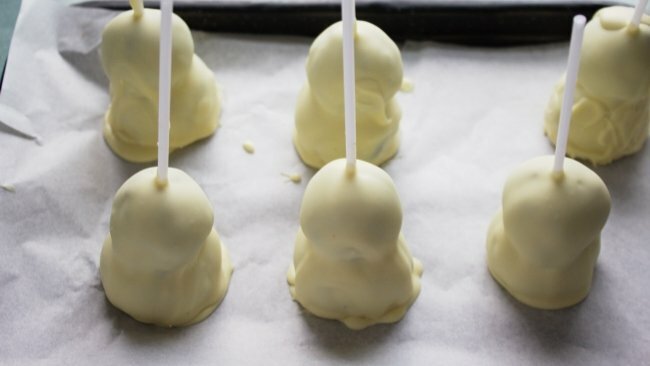 Snowmen Brownie Pops - soft gooey brownies covered in white chocolate. Have fun & decorate with coloured fondant, glittery sweets & sparkles for a cute edible Christmas gift! Add your brownies to a large bowl and mash together with your hands before shaping into 12 balls - 6 larger balls (2½ inch) and 6 smaller balls (2 inch). Stack two balls, smallest one first, then a larger one onto the end of each pop stick to make a snowman. Place brownie pops onto greaseproof paper, flattening the bottom larger ball slightly until pop can stand on it’s own. Place your "men" in the freezer for a couple of hours until completely frozen. Break the white choclate into small pieces and place in a large bowl over a pan of simmering water, making sure the bottom of the bowl isn't touching the water. Add a tablespoon of rapeseed oil and stir to coat the chocolate. Once the chocolate has melted, give it a good stir before dipping the frozen brownie pops one at a time. Shake off excess coating and place dipped brownie pop back onto greaseproof paper to set. 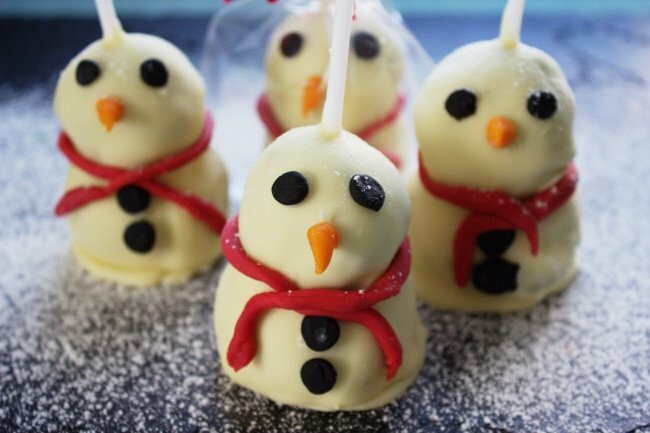 Once the brownie pops are completely dry, have fun and decorate - use a small amount of melted white chocolate to stick your decorations to the snowmen. Pop your snowman into a cellophane bag and tie with ribbon. 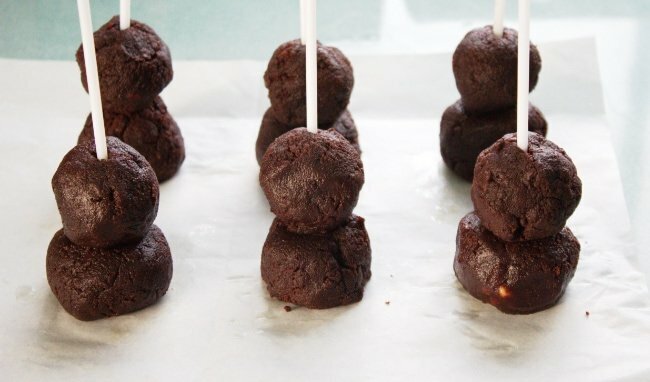 Snowmen Brownie Pops will keep for up to a week stored at room temperature. Treat Petite co hosted by Stuart over at Cakeyboi and Kat from The Baking Explorer, hosted this month by Kat. Charlotte’s December Food Calendar over at Charlotte’s Lively Kitchen. For someone not into cake decorating, these are mighty fine specimens. It’s not my thing either and I know I couldn’t do nearly such a good job. Your snowman pops are super cute Sarah. Thanks for sharing them with We Should Cocoa. I hope you had a good Christmas and best wishes for a happy, healthy and successful 2017. Thanks for your kind comment Choclette and wishes for the new year. Wishing you all the best for 2017 too. These are so adorable! Almost too adorable to eat.. almost…but I still would! Thank you for linking up to Treat Petite! Thanks Kat, they are almost too cute to eat but we did 🙂 A pleasure to link up with Treat Petite. SO adorable and a fun gift for kids during the holidays! Thanks Michelle, we really enjoyed making them and they have been very popular with the kids. Oh these are just the cutest! What a fun treat to make with little ones over the Holidays! Thanks Donna, I think the children could make a lot better job of decorating than me and they would certainly enjoy making them. I’ve always wanted to make creative fun desserts but I keep putting it off. 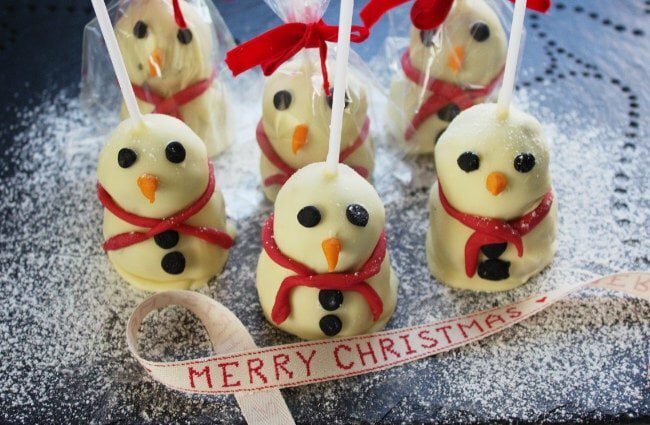 Your snowmen brownie pops are adorable! Thanks April, I’m not very creative when it comes to fondant icing but these were so easy to make, I’m sure you would enjoy making some. How cute! My son would love making these. So perfect for the holidays. I love the little scarves. Thanks Tara, my friend’s children had lots of fun making some snowmen and they used sweet strawberry laces for the scarves. These are ADORABLE! The kids would LOVE these! These look so easy to make for a fun holiday treat! Thanks for sharing. Thanks Kimberley, I can’t take credit for the idea, I saw them on Pinterest last year and thought I’d have a go. These are so adorable and look easy enough to make for this non baker. I have to try these with my niece and nephew next week. What a great idea Sarah! They’re so much fun and a wonderful idea for edible gifts especially for children (though i must say I wouldn’t say no to one, or even two 😉 ). Great tip about the vegetable oil, I’ll be trying that. So Cute that little army of snowmen! Just irresistible! Thanks for popping by Marie – Pierre. These are so cute. Perfect for little “school” parties….for to give away as gifts. They would really make the cookie tray look great too. Thanks Gloria, what a good idea, I reckon I might try a snowman party with my nephews next year. You’re so creative Sarah! Would love to try it. Have a wonderful weekend! Thanks Mandy, they are so easy to make too.